i got to go to the movies yesterday! kim and clinton were here an extra day for the holiday weekend, jordan was home from school, and i was off of work, so we took all the boys to see the new alvin and the chipmunks movie, which clinton call "the girl alvin and the chipmunks". 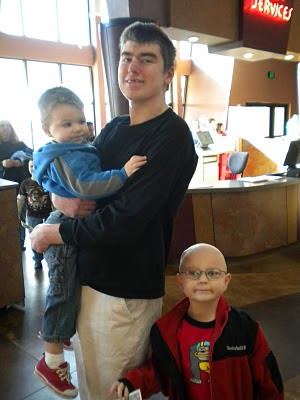 here is jordan (16) holding max (2) and clinton (5). 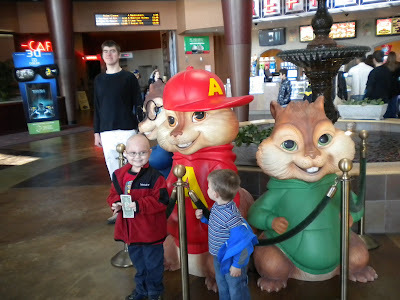 the chipmunks were even at the movie theatre...how cool is that!?!? 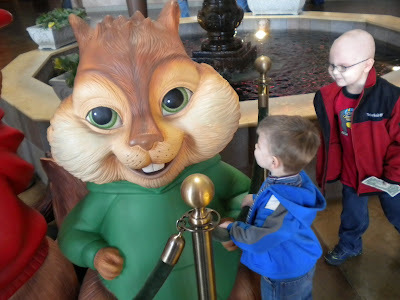 max gave theodore a kiss...too cute!! clinton had lots of fun! 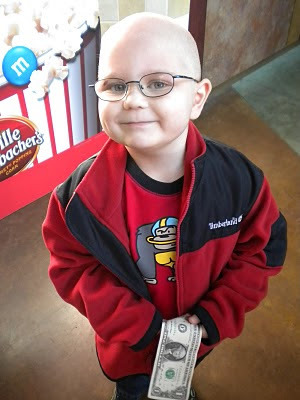 he and jordan both had dollars that they were going to spend, but kim told them to just keep their money, so she shelled out $56739.08 for snacks for everyone...it still shocks me how much things cost at the movies!! after the movie we went back to their house and just visited for a while before jordan had to go back to school and kim and clinton had to go back to memphis. a great afternoon with awesome boys! !